Forgive any perceived sarcasm, but in case you didn’t already know, Miami Springs, like most of South Florida was carved out of the Everglades. Much of where we live used to be a swamp full of wildlife, including alligators. Alligators can be found in virtually any body of water throughout the State of Florida. If you live or visit South Florida and Miami Springs, you need to be aware that all bodies of water can have an alligator…whether you see or sign or not. 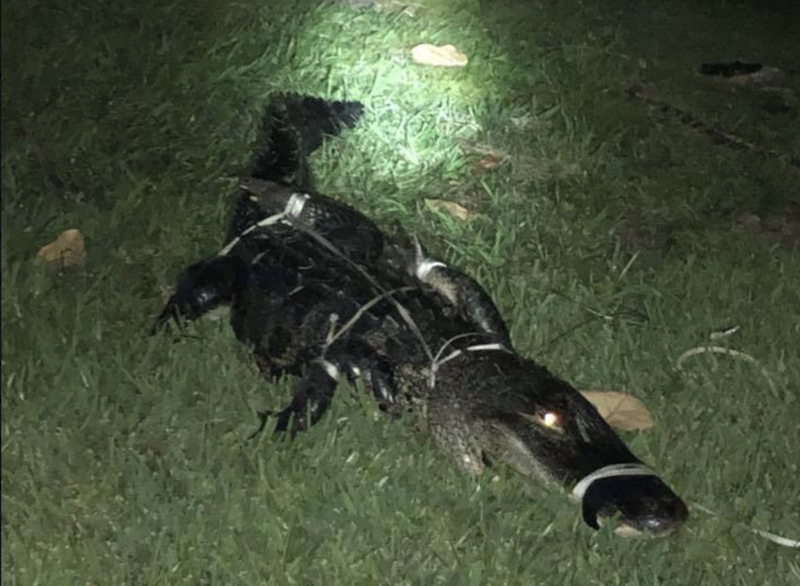 So, it’s no surprise that a 9 foot gator was trapped Tuesday evening near Lake Drive. As you can see in the satellite photo below, these lakes connect with the Miami River Canal, a virtual water highway that connects Lake Okeechobee to Biscayne Bay. Below, you’ll see pictures of the 9 foot gator caught Tuesday night on Lake Drive. NEVER feed an alligator. It removes their fear of humans and they start to associate humans with food. Adult alligators like to eat small mammals. Be careful when walking your pets near any body of water. The recent alligator attack in Davie occurred with a woman walking her dogs near a lake. Be careful with your children near bodies of water. NEVER enter fresh water bodies of water under dark conditions. Alligators are opportunistic feeders. Their diets include prey species that are abundant and easily accessible. Juvenile alligators eat primarily insects, amphibians, small fish, and other invertebrates. Adult alligators eat rough fish, snakes, turtles, small mammals, and birds. Female alligators rarely exceed 10 feet in length, but males can grow much larger. The Florida state record for length is a 14 foot 3-1/2 inch male from Lake Washington in Brevard County. The Florida record for weight is a 1,043 pound (13 feet 10-1/2 inches long) male from Orange Lake in Alachua County. About 1/3 of alligator nests are destroyed by predators (mainly raccoons) or flooding. The average clutch size of an alligator nest is 38. For nests that survive predators and flooding, an estimated 24 live hatchlings will emerge. Only 10 alligator hatchlings will live to one year. Of these yearlings, 8 will become subadults (reach 4 feet in length). The number of subadults that reach maturity (6 feet in length) is approximately 5. Alligators occur from southeast Oklahoma and east Texas on the western side of their range to North Carolina and Florida in the east. They prefer fresh water lakes and slow-moving rivers and their associated wetlands, but they also can be found in brackish water habitats.